Golf cart use has exploded off the golf course. Although cart manufacturers seem to assume golf carts will only be used on the course, they are increasingly being seen in airports, event shuttle services, schools, malls and golf course communities, particularly those with cart paths along the public roads like The Villages. Thousands and thousands of people suffer injuries related to golf carts nationwide each year. These injuries have exploded over the last decade. One of the most common injuries related to golf carts is an ejection injury. These typically occur to the passenger who is ejected when the driver executes a sharp left turn. Even though carts are limited to under 20 mph on level ground, significant injuries frequently occur since the passenger has no seatbelt and very little to hold themselves in place. Golf cart ejection injuries can happen when a playing partner who is driving carelessly executes a hard left turn ejecting their passenger. They can happen away from the course when someone is being transported from one place to another on a golf resort, at a concert, in a parking lot or simply on the street. It is common for an ejected passenger to suffer head trauma leading to brain hemorrhage and traumatic brain injury, as well as shoulder fractures, collarbone injuries, shoulder dislocations and arm fractures. Golf cart rental companies are a growing trend in many of Florida’s popular tourist destination cities. Someone who rents a golf cart to scoot around town may have no familiarity with how they operate or the potential danger of an ejection injury for their passengers. Golf carts have a unique position in the insurance world. In Florida they are considered to be a dangerous instrumentality, which means the owner is strictly liable for the injuries they cause. 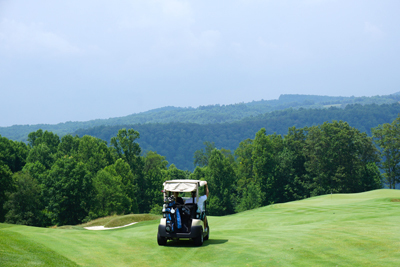 In a typical golf course injury in which a passenger is ejected, the driver could be insured by their homeowner’s insurance policy, while the golf course should be covered by a commercial liability policy insuring each cart. When used in a neighborhood, on a golf cart path in a gated or senior community, or otherwise not on a golf course, the golf cart may be covered under the owner or driver’s homeowner’s policy, a specific golf cart policy, or under the owner or driver’s auto policy. A growing trend in some of Florida’s tourist resort communities are golf cart rentals. The operations allow people who may have never driven a golf cart in their life to zip around in traffic having no awareness of the danger they pose of the ejection of their passenger. We have experience representing people who were hit by a golf cart, ejected from a golf cart, or hit by a car while driving a golf cart. If you or someone you know has been injured after being ejected from a golf cart, we encourage you to pick up the phone and call our office to have your questions answered. We will help give you a clear understanding of what you should do next and what you can expect over the coming months. One of the most frustrating aspects of having an injury claim is the feeling of uncertainty about what you should or should not say to a claims representative who may call you on the phone. Let us help. Contact us online or call us directly at 727.446.0840 to schedule your free consultation.